Not many people know, how to properly sharpen butcher knives and you may be one of them. Whether you be a professional or an amateur kitchen lover, sharpening knives is core to a smooth cutting process. Well, you could even be a butcher who is new to duty and still need skills. 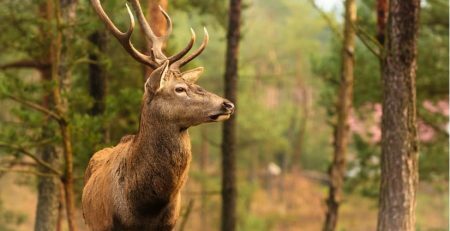 In this article I will show you, how I do it and what is the best way – in my opinion – to sharpen a knife. There is many other ways, different than my approach and that’s also fine. I will just show you what works best for me. Anyway, knowledge, how to properly sharpen butcher knives is very important. Sharpening knives is an extremely simple process. A butcher knife should be one that lasts with you for a long time. Knife sharpening appropriately ensures that you cut through with ease, without thinking that “you need to get a new knife every month”. You shouldn’t worry about using a knife sharpener though. 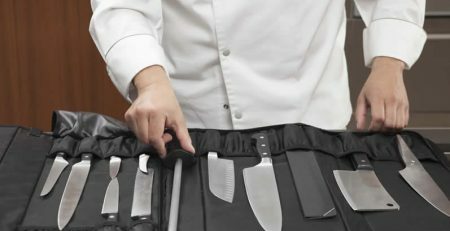 Below, I’ll teach you the proper manipulation techniques, which will help you with sharpening your knife, for a better cutting process. Determine if your knife is sharp or dull. This is the first part of the process, and of course there are techniques on how to tell if your knife is sharp or not. As a general rule though, you should be doing this as often as possible. (ONE): Try to chop a small newspaper or magazine with it. Since you’re testing your blade’s sharpness here, you might as well do it on something that feels quite thick. A good old newspaper, or even a magazine, will help you do the trick here. Of course at this point, it is necessary to know “what is the definition of sharp”. For the previous case, sharp would be when the knife cuts through the magazine, without needing an overpowering blow. (TWO): Test the knife on your finger nails. This is a little bit dangerous so you need to watch out. Basically, what you do is you place the butcher knife with the blade being at the tip off your finger nail, and then push really softly, and see how the knife does. A sharp knife in this case will pierce through the nail without effort, this being a gentle push. So there you have it, the definition of sharp for knives. Now we move onto the method. There are many ways to sharpen your knife. Some are old school and the others are more modern, where a knife steel is used for the job. Then of course, you have the new technological advancements of our age, which allow you to sharpen your knife through the use of a machine. No worries. We’re going to list them all below for you. This is one of the most difficult ways you can use to sharpen your knife and you will need a little bit of practice to make the process effective. Basically, what you need is a sharpening stone and also, it is important to add a little bit of oil or water on the stone which helps to keep the stone lubricated and prevent the knife blade to not get too hot. Once you start using water for one sharpening try to don’t use oil next time. This rule also applies if you start using oil first, then try not to put water next time. So basically, you start off by selecting the type of stone to use, and this here refers to stone quality. So for example, you can use diamond-edged stones, or ceramic stones, or simply a hard stone. In terms of coarseness, diamonds are generally the best, followed by ceramic, and then the hard stones. Next, you’re going to need to properly position your blade’s edge, to the stone, before starting the sharpening process. You do this by placing the knife to the stone at a 20-30 degrees angle. Calculating this angle is simply done by putting your knife in a position perpendicular to the stone, and then moving it 2/3 the way down. This would make the angle between your knife and stone 20 degrees. And from there, you simply start the sharpening process. Make sure that when sharpening, you swipe the blade all the way through to the tip. You may need to push a little into the stone, depending on the degree for coarseness. Non-coarse stone require extra pressure on your part to do the trick. Generally, you’re going to need around 7-8 brushes and sometimes more on each side for a job well done. It all depends on how dull is the knife. Remember, you’re not stroking one side of the blade. You’re stroking two. Of course when you’re done, don’t forget to apply the tests we mentioned earlier for checking knife sharpness. You don’t want to over-sharpen your knife, or waste too much time on the job. Watch this video which illustrates all the steps above. Now, let’s have a closer look, how to use a honing steel. A steel sharpener is usually something that will come in knife sets, but you may buy it alone if you wish. I remember when my friend who is also a butcher told me a great sentence that using a steel is like brushing your teeth and you have to do it often, but sharpening knives using stone is like going to your dentist and you don’t want to do it too regularly. In other words, using a steel you can’t sharpen a knife. It just corrects the edge of the blade and making it sharper. I will talk about the difference between honing and sharpening a knife later in this article. Alright, now to the methodology. Unfortunately, instructions manuals don’t really come on how to sharpen a knife with a steel. As such, a lot of people use them incorrectly, and not getting the sharpening job done well. No worries, we’ll show you the correct way right away. Using a steel sharpener is quite simple, and requires just a few instructions. The first is top position the knives with the tip touching the kitchen counter, so that the sharpener is perpendicular to it. Second, hold your knife to be at approx 20 degrees angle from the steel. At this point, the positioned sharpener should look like a car gearstick, with the handle being in your hand, and the tip touching the counter. This should provide a good enough positioning to help sharpen your knife without trouble. The reason for this positioning, is that it helps fit the sharpener, so that it doesn’t shake in your hand while sharpening. This tends to happen a lot when people try to sharpen a knife with a steel in their hand, and no support. Sharpening occurs by swiping the blade in an arc motion across through a single point in the sharpener, where it looks like you’re pulling the knife back. Repeat the sharpening process with the other side of your butcher knife. After sharpening a few times, apply the sharpness test on a piece of paper or your nails to gauge. Alright, now we move on to the most advanced of all sharpening pieces technologically. You really won’t find many guides on how to sharpen a knife with an electric sharpener, and that’s because you really don’t need one. 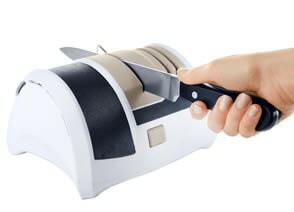 Electric sharpener are the least risky method of sharpening around, and the easiest to use, with minimal instructions. At most, it may be a “1-2-3” guide after you purchase your device. An electric knife sharpener can be basically considered as a multi-coarseness sharpener, with a variety of options per device. For example, the existence of different degrees of coarseness per device, could be akin to owning a complete stone set for knife sharpening, this being diamond, steel, and hardstone. This allows for varying degrees of sharpening, and accommodates all knife blade thicknesses (and so not just butcher knives), but also serrated knives and many other types of blades. Alright, now to the sharpening process. Being the easiest of all of the 3 techniques I showed you today to use, all you need to do is to place the knife in the device and pass it through. This will feel like swiping a plastic card to a minor degree. 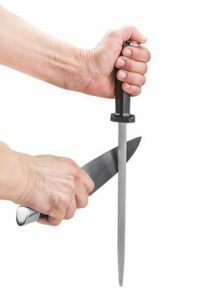 When positioning the knife, for maximum effectiveness, make sure that the tip of the blade facing you (when holding the knife in a down motion), is placed at the back-end of the swipe zone. This is basically akin to swiping an entire card from start to finish, and will ensure that you sharpen the entire blade without trouble. Because the sharpening process is actually much stronger here, this should be repeated only 2-3 times per side, for each stone variant you pass the knife through. After all, you just want to sharpen your knife for use. The last thing you need is a knife break. 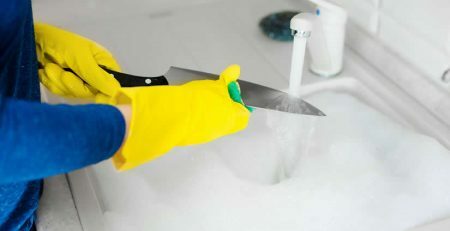 After the sharpening process, make sure that you clean your knife. This is to remove any kind of small metal pieces from the knife, which were a by-product of the sharpening process. You don’t want those to end up in your food after all, do you? Alright, now we’re done completely with sharpening part. Next, we’re going to discuss misconceptions related to knife sharpening. This would be the difference between sharpening and honing. Different tools in similar categories may get mixed up with ease. Such is the case with honing devices and sharpening devices. Both may be confusing to you, and as such, we’ve included this piece of advice to help you tell the difference. Understanding the difference between honing and sharpening, requires an understanding of why blades go dull. To simply out, a blade will dull when the edge has been lost, of when position of the edge is not centered (meaning that the edge is in the incorrect position). • Honing pushing the steel edge back to the knife center. The edge is corrected without shaving as much as possible of the edge’s material. While honing has no sharpening effect on the blade, when perfected, it can allow the blade to give off the illusion of being sharp, due to the new centering. The honing process should be done as much as possible, before knife use. • Sharpening on the other hand shaves the knife, and this has been seen multiple times in our guide on how to sharpen a knife. Learning, how to use a sharpening stone, steel piece, and electric sharpeners are all a part of this. Sharpening unlike honing, may be done on a less frequent basis, maybe a few times a year. • When using electric powered sharpeners, watch out for the heat as much as you can. Heat generated from the stones may cause damage for the knife, device, or you, if you misuse the device. • Sharpening stones need to be clean and particle free for proper use. Therefore, try to use an oil for lubrication on your stones. Just remember that once you start with oil, you cannot switch to water. • Accidents may occur when sharpening knives. As such, keep a first aid kit as close as possible. • Technique isn’t everything, as the quality of your knife’s blade matters too. When sharpening a butcher knife, you may find that it dulls really quickly after use, and that the edge gets dislocated, requires too much honing. This will occur mostly with cheap stainless steel blades. As such, there’s no need to feel frustrated. We would highly recommend you get a good quality blade instead. If you are looking for a high quality knife sharpeners just click the link beside, which will bring you to my reviews. Hello Greg, you surely know about knives. The method of sharpening you mentioned first reminded me of my young age when I used to see butchers sharpening their knives. The best is the electric sharpener which is very easy. Can you let me know where can I buy it? Thank you for your tips on safety as well. It is a good post. Personally, I prefer to use the ‘old school’ methods such as sharpening steel or stone, but I had a few electric sharpeners in my life and I have to admit that these days the quality of them is really good. I will shortly post reviews with a links where you can buy different products such as knife sharpeners, butcher knives etc. I have a kitchen full of good quality knives. All dull to the bone. I’m actually sick of trying to find ways of sharpening them. I really wish I could take them to a professional, to have them done. Why are there no places left where you can take your knives too? I watched the first video and found myself screaming at that guy, “will you shut up and start sharpening the knife”, he just talked so much, sorry. I will try some of these ways and see if they work. Thanks for providing these great tips. One last thing, do you have any links where I can buy these stones and sharpeners. That would help a lot. Thanks. Thank for visiting my site and your comment. I know a lot of people with similar problem with the dull knives, especially at home. I have an older set (10 years or so) of knives that I use daily and although I received a steel with the set, I can’t say as I’ve used it often! I’m guessing I should be doing it more… cutting through raw chicken just isn’t as easy as it once was. Thanks for the instructions and video on how to sharpen knives with a steel – it was helpful, especially the “gear stick” imagery. I’m happy that I could help. I think I will get the electric sharpener. It’s the easiest, least risky, and takes the least time! In fact, even though I am not a butcher, sharpening knives is still important, because when you want to eat dinner and the meat is too thick and your knife is too dull, then it’s frustrating. I think everyone should have one of those in their kitchen. If you are not a butcher then electric knife sharpener will be the best option. It is actually more dangerous to have a dull knife. I’m not even mentioning the comfort of cutting meat with a properly sharpen knife if you compare to the dull one. It’s only about 5 minutes and can make your life much easier. Hi Greg. I am just the griller of the family and my best knives have been feeling dull. I didn’t know sharpening was so deep. but I see your point. I certainly knew nothing about honing so you taught me something today. I think it is about time for me to start looking into an electric sharpener that will be more up my alley. At least you taught me how it should be done. I would love to see the products you suggest. Thanks again. Therefore I decided to solve that problem and write this article. Never thought such a useful and essential thing that we use daily in the kitchen can be presented in such a wonderful manner. Indeed a great niche. Though I thought its little risky but thanks for teaching and providing ways to sharpen knife Electric sharpener was a better option. Thanks again and wish u good luck. I’m more than happy that I could help you to pick the right type of a knife sharpener. I’m also glad that you like my website and review.